When most people think of personal protection dog training, they think of big, scary dogs with spiked collars on and equally scary owners. Sadly, many dogs (such as those of the Bully breeds or Pit-Bulls) have been used and abused in this regard. But while there definitely is a dark side to it, that is not the intention of proper personal protection training. One aspect of Mondio, French Ring Sport and Schutzhund, it's not simply a "dog gone wild", but the result of careful training. Each dog trains for hundreds of hours in order to compete in these sports. Schutzhund involves scoring in three components: obedience, tracking, and personal protection. But there is a big difference between personal protection dog training and Schutzhund (or other related sports). Schutzhund is for fun, plain and simple, and the dogs know it. Exercises are mostly choreographed. Personal protection dogs, on the other hand, are not sporting; they are completely capable of taking down an armed assailant if need be. In fact, most dogs who are trained in Schutzhund cannot be protection dogs. Why? Different drives are encouraged - sports like Schutzhund draws upon a dog's prey drive, while personal protection draws upon his defensive drive as well as prey drive. What this means is that a dog trained in Schutzhund won't stand up to the stress and pressure of being threatened. It's an environment that he is not used to working in, whereas a protection dog is trained under many difference environments and under high stress and pressure. Dogs who are trained for the police and military go through rigorous personal protection training, as well. Sometimes even family pets are trained in this discipline for added security. That being said, I don't usually recommend this type of training for most dog owners. Before personal protection dog training can even begin, a dog must pass several important tests. Not just any dog can be trained for protection, and it requires certain instincts and temperaments in a dog. Unfortunately, there are people out there who train a dog to be aggressive towards humans. This is not the same thing as protection training! The first test for a potential protection dog is that of obedience. Before you can even start working on personal protection dog training, a dog must have at least achieved a basic level of obedience. This includes sit at heel, sit-stay, down at heel, down-stay, stand, heeling, and come. It's important to continue obedience training past this level, though, as a dog must be able to work off-leash reliably with you in protection training. Once a dog passes an obedience test, the dog must be tested for people aggression. For this test, the dog should be sitting in the heel position beside the handler. The tester will approach the handler, say "hello" and shake hands. Then the tester will back up, and approach the dog this time, allowing him to sniff his hand and then petting him. If a dog doesn't pass this test, he cannot continue, as he will be a liability and danger to everyone involved! Protection trained dogs like Heidi (a Belgian Malinois) are trained not to let go of the sleeve no matter what! Most dogs have prey drive, to some degree or another. This drive is easy to spot - even puppies are displaying prey drive when they chase after a toy and shake it. It's prey drive when your dog chases a squirrel or ball, too. This is a comfortable, "safe" drive for a dog to be working in. Even a happy-go-lucky lab has prey drive! When training a young dog for protection work, prey drive becomes the foundation to work from. It's used to teach a dog how and where to bite by using a sack, tube, or bite sleeve as the "prey". Dogs have fun with this training, as it's like a game of tug of war for them! A good indicator of what type of drive you're seeing in a dog is whether it disappears when the dog gets tired. As we'll see soon, defense drive will remain even if a dog is tired. As for bark and body language, you'll probably see the dog's tail up or wagging and his bark will be a higher pitch and insistent. In other words, he's relaxed and comfortable. Prey drive can be enhanced by playing fly ball or discus with your dog. So what does a prey drive test for personal protection dog training look like? The dog now needs to be wearing a flat-buckle collar on a 6-foot leash, and be on a release (or free) command. The tester ties a toy or sack to a long line to use as a lure. After swinging it in the air, he'll run and drag it on the ground. The dog should chase after it and hang on to it, displaying a high prey drive. If the dog won't hold on to the toy, chase after it, or show much interest in it, he won't be able to continue as his prey drive simply isn't high enough for protection training. Let's assume the dog passes, and moves on to the next test. He'll now do a threat recognition test, otherwise known as a courage test or defense drive test. A dog's defense drive is the innate instinct to protect himself or his handler when threatened. Very different from prey drive, a dog's body language and bark will totally change. His tail will lower, hair may be raised on his back to make him appear bigger, teeth showing in a snarl, and his bark will become deep and low. 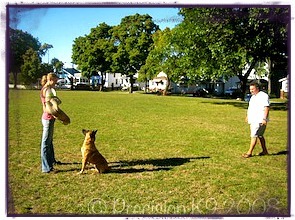 Personal protection dog training is very controlled. Here, Heidi may not break this sit-stay unless the decoy (me, in this case!) makes a move. Although it may begin to show in puppies 4 to 5 months old, defense drive doesn't develop fully until a dog reaches maturity. This is usually around 18 to 24 months of age, or as late as 3 years old for some dogs. A dog should NEVER be rushed into defense training, as he won't be able to handle the stress until he's reached mental maturity. The best time to start introducing defense is around 11 to 14 months of age. Defense drive is enhanced by confrontational and head-on situations where the quarry (or helper) comes directly at the dog. Again, the dog needs to be wearing a strong flat-buckle collar - with good brass hardware - and be on a 6 foot leash, on a release command. The tester will act intimidating and threatening of the handler and dog, by shouting, charging towards the dog (both a vocal and physical threat), cracking a whip in the air and on the ground. This measures the dog's courage! So what are they looking for in the dog? The dog must either stand his ground (at the handler's side or in front) or bark and lunge at the tester. It's interesting to note that just because your dog barks at people through the backyard fence or the front door, doesn't mean that he has defense drive. This barriers give a dog courage, but 99% of the time, when you take the barrier out of the way, the dog will lose all that bravado! 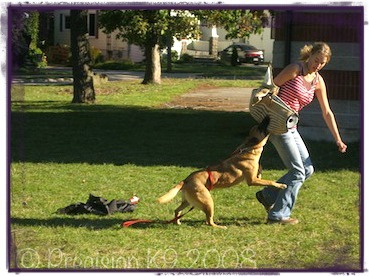 Personal protection dog training is very different from Schutzhund and other related dog sports. It is where the "men are separated from the boys", so to speak. The majority of dogs do not have what it takes to be protection trained, and this has a lot to do with genetics. Any dog can have a good prey drive, but most dogs don't have defense drive - and it's not something that you can train into them! Remember, these dogs are not aggressive, nor are they uncontrollable. It takes years to fine-tune a dog's drives to this point, and the dog's handler is always in control. These dogs are used mostly in police and military work. I am completely blown away by what these teams can do! Here's a great protection training movie that I'm going to leave you with. Please, don't try training your dog in protection because it looks cool. This is serious business - if you really feel that your dog has what it takes, find a very experience professional trainer to work with.